Controlled temperature is important in the production of semiconductor devices. The process requires highly precise and effective liquid cooling or air condition cooling. Opti Temp provides thermal temperature management for many chip manufacturing technologies with liquid chillers for the semiconductor industry. The semiconductor industry has experienced growth in recent years and Opti Temp has not missed the opportunity to grow with it. These semiconductor systems have specific needs that require precise temperature control, resulting in lower defects and greater yields during rapid thermal processing of silicon wafers for the semiconductor industry. 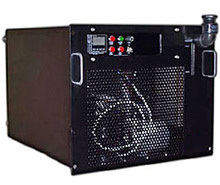 Chillers that provide accurate temperature control are also important for environmental control and energy conservation. 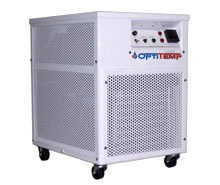 Opti Temp offers several complete lines of high-quality Recirculating Refrigerated Fluid Chillers and non-refrigerated Heat Exchangers that can be integrated into the production of silicon wafers for the semiconductor industries and for other systems used for research and development. Since 1990 Opti Temp has proven to be a reliable supplier of Fluid Chillers and Heat Exchange equipment for a number of semiconductor applications. Opti Temp will build a standard system for you or, if needed, design to customer requirements for size, portability, operating conditions, thermal load, and system footprint. Designed for the industrial environment with a long service life in mind these chillers are recommended for all types of semiconductor manufacturing processes.